PALO ALTO, Calif., Feb. 2, 2017 /PRNewswire/ -- Jive Software, Inc. (Nasdaq: JIVE) today announced that it was named a leader in Experton Group's 2017 social business vendor report1, which benchmarked a broad range of vendors that offer both internal and external collaboration and communication solutions in the German market. Jive's Interactive Intranet and Customer Community solutions were each featured as top leaders in their respective categories, with Jive's portfolio attractiveness ranking the highest of all vendors. Experton Group is the leading fully integrated research, advisory and consulting company in Germany. Its benchmarks analyze relevant providers, and use a multi-phased research and analysis process to position vendors based on their portfolio attractiveness and competitive strength in the market. Frank Heuer, senior advisor at the Experton Group and author of the report, said, "Out of the 100+ social business vendors we studied for this report, Jive is one of only around ten companies that achieved leader status in more than one category. These high marks are well deserved, given the comprehensive scope and flexibility of Jive's internal collaboration functionality, as well as its focus on the digital customer journey with community offerings that include social analytics, clearly structured dashboards and integrated CRM and SEO functionality. Jive is an international leader with many renowned customers and users, including companies in the German market." "This latest Experton recognition builds on the global accolades we've received again and again from independent experts who see the proven value of Jive's collaboration hub approach," said Simon Lappin, regional vice president of sales at Jive Software. "Jive's intelligent work graph, as well as other technologies emerging in the industry like voice recognition and artificial intelligence, are poised to reinvent the digital workplace. With more companies around the world embarking on digital transformation strategies, it's an exciting time to be a leading provider of collaboration solutions." 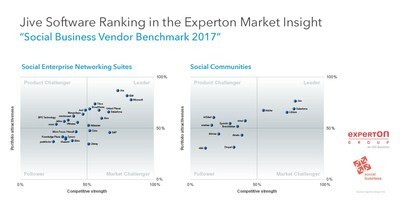 A complimentary excerpt from Experton's Social Business Vendor Benchmark 2017 can be downloaded on Jive's website at https://www.jivesoftware.com/resource-library/analyst-reports/experton-social-business-vendor-benchmark-2017.